Caracas – Longstanding fears of a Venezuela debt default crystallized Wednesday, as the political crisis engulfing the sinking OPEC state deepened with a meeting set at the UN Security Council and the EU eyeing an arms embargo. Investors were bracing for what looked to be an inevitable “credit event” that analysts said could arrive within days — before a “refinancing and restructuring” of the debt called for by President Nicolas Maduro. While the country’s isolation means the risk of contagion to international financial markets is limited, a default could trigger a global rush to seize assets owned by the Venezuelan government and its state oil company PDVSA, and plunge the struggling nation into a full-blown humanitarian emergency. Already, its 32 million citizens are suffering shortages of food, medicine and other essentials as their money, the bolivar, is decimated by hyperinflation and recession reigns. Hundreds of thousands have left the country to survive, and many, many more could follow. The United States, which has slapped successive sanctions on Venezuela and its ability to issue new debt on US markets, called for a UN Security Council meeting next Monday to discuss the crisis, particularly its political aspect. “What we have today in Venezuela is a state of non-democracy with many violations of human rights and political rights,” Argentine President Mauricio Macri said in New York after meeting with UN Secretary-General Antonio Guterres. He told the Financial Times the US should impose “a full oil embargo” on Venezuela. Such a move would have “broad support” across Latin America, he said. The US and several Latin American nations, including Argentina, call Maduro a “dictator” for his quashing of dissent, especially sidelining the opposition-held parliament and seeking to arrest opposition figures. National Assembly number two Freddy Guevara has taken refuge in the Chilean ambassador’s residence in Caracas to avoid arrest after the Supreme Court, loyal to Maduro, stripped him of his parliamentary immunity. Recent regional elections that declared a victory for Maduro’s Socialist Party have done nothing to reverse international condemnation of the president’s perceived autocracy. European Union countries backed an arms embargo on Venezuela as part of a sanctions package also set to include a blacklist of Venezuelan individuals, diplomatic sources said. “The political aim remains to force the government to get round the negotiating table with the opposition and contribute to getting out of the current political crisis,” one diplomatic source said. The only bright spot for Venezuela was Russia saying Caracas had agreed to its terms for restructuring the part of the debt it holds, with an accord to be signed within a week. “Venezuela has confirmed the conditions that were agreed and so the process will move to a final phase,” minister Anton Siluanov told the Interfax news agency. Venezuela’s official debt to Moscow stood at $2.8 billion as of 2016, with another $6 billion owed to oil giant Rosneft, which is closely allied with the Kremlin. That, however, is just a fraction of Venezuela’s total debt mountain, estimated at $150 billion. Around $45 billion is sovereign debt, another $45 billion is owed by PDVSA, and $23 billion is owed to China, according to estimates by private consultancies. For a country with the world’s largest proven oil reserves — nearly 300 billion barrels, worth more than $15 trillion — such debt normally should be bearable. But decades of mismanagement, destruction of Venezuela’s private sector, big spending on social programs, lack of infrastructure investment, rigid currency controls and the fact that oil exports are now essentially debt repayments rather than income all conspire to shove Venezuela to the edge of the precipice. The country has just $9.7 billion in hard currency reserves, yet debt payments due in 2018 total $8 billion. Major credit rating agencies Fitch, Moody’s and Standard & Poor’s have all downgraded Venezuela’s standing and say default is all but certain. One market analysis firm, Capital Economics, says default could happen as early as this weekend. Other analysts say Venezuela will try to stave that off beyond Monday, when foreign creditors have been invited to Caracas to hear the restructuring proposal. Some suggest a default would allow Maduro to spend money currently diverted to creditors to allow more imports of food and medicine ahead of a possible re-election bid in 2018. 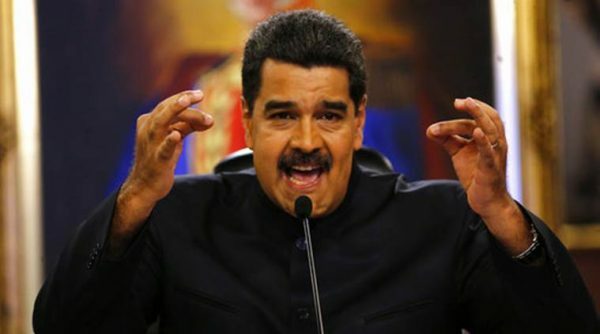 “A default would free up resources to pay for imports, giving Maduro in the short-term political boost for re-election,” said Risa Grais-Targow, Venezuela analyst for the Eurasia Group. Such spending could “lower the risk of protests,” agreed Diego Moya-Ocampos, of IHS Markit. Yet a default would likely see investors suing to get hands on Venezuelan and PDVSA assets — oil shipments, tankers, bank accounts, and the US refinery subsidiary Citgo. That would rob Venezuela of much of its capacity to sell its all-important oil. Might be Québecan French from Montreal. You’re quite obsessed with Montreal. Or is your obsession with Hind. Most people here (or in general) don’t like her. Don’t pretend like I’m the exception. “Most” people here are also like you: zionist trolls. Either way, whether she is liked or not isn’t relevant. It’s your obsession with her that is deviant. We are pretty funny though. Shame you don’t enjoy our company. What’s a zionist troll meant to be btw? someone who’s not a holocaust denier? You’re diverting. The topic is your obsession with Hind – for five years now. It’s your life but frankly, it’s sad. That 40-something year old Dany Nohra who she’s stalking on twitter? I understand the required due diligence about “Danny Nohra”. What’s certain is that you’re not new here and are very familiar with Malmequer’s posts. Writing styles can be altered – I’ve seen it here and else where plenty of times. Some are also dumber than others – take “Niemals” here who posted under several usernames (Intouchables, Descartes, OhYeah, Matrix, O’Matrix, AnnoDazumal, etc). The immoral degenerate he is went as far as “retiring” one of his username when 5th Drawer (May He RIP) passed away. Yes darling. You and I both know who’s the insecure wuss here. I find it interesting that you, always, come out of your hole when I mention trolls. How is “CALVIN DOG” aka “CHASE” aka NY criminal attorney Jeffrey Lieberman doing? That’s wonderful darling. Have a lollipop. Ok I won’t speak for others as we all come from different academic and vocational backgrounds, but I can detect differences (or similarities) in writing from a mile away. The context doesn’t matter, nor which website it’s on or what the topic is about. I can always tell. It’s the same with people’s body language by the way — you can try and omit information, but your body will always tell on you. Now, with regards to Hind whining and raving that Malmequer0 is the same as that Dany Nohra twitter guy, that is not the case. Two different people, one paranoid woman. I find it funny that apparently I’m also Dany Nohra, a “Lebanese war refugee” living in New Jersey. I do not live in New Jersey, as anyone can tell from the timing of my posting activity, not in that age bracket, and not a refugee. Soz, paranoid crazy lady strikes again. I didn’t say writing styles cannot be detected but that they can be altered well enough to deceit. Whether you are Malmequer and/or Dany Nohra is not something I wish to discuss longer. If you say you are not then so be it. All I know is bag you are not new here and on other sites since you know Hind and Malmequer’s years-old posts well. Dear Hind is well known among some and quickly becomes known as she speaks, regardless of the name she uses. Some many have multiple names, so many change their names at their whim and after they get banned. Deal with the comment. Some many have multiple names, so many change their names at their whim and after they get banned. You seem to speak of experience. Yup, seen many who have multiple names and really don’t care. The post is what you respond to. When I said you speak of experience, I meant to say you too had (have?) multiple usernames.